💥La Shana Tova!! Happy 5779 New Year!! I am excited to use your recipe. I will use my Orthodox Jewish grandmother’s Food Mill. Thanks for the recipe Sounds quite like what my Grandmother Mollie who came from Budapest mad many years ago. I LOVE chopped liver. It is seriously one of my favorite Jewish foods, and I could really eat it by itself as a meal. One day when I have the guts I will take the plunge and try making it on my own. Give it a try Lacey! It’s not too hard, especially if you prep the schmaltz in advance. The rest is fairly simple! Very nice recipe! I’m the only one in my family who loves chicken livers so finding this rendition of an old favorite that my mother used to make is appreciated. The schmaltz and gribenes are essential! Turned out great. I’m looking so forward to trying your recipe. I hesitated until I saw your answer to whether chopped liver can be frozen, you answered that it freezes well. That did it for me because it will only be me who will be eating it. I have the supermarket schmaltz in my freezer and want to start using it. If your chopped liver tastes nearly as good as Zabar’s in the Upper West Side of Manhattan, I’ll be very satisfied – their’s is delicious! Yes you are quite right, chopped liver is not for the faint of heart (pun intended). However, fear not…I came up with a solution that does not alter the taste, and is quite scrumptious. 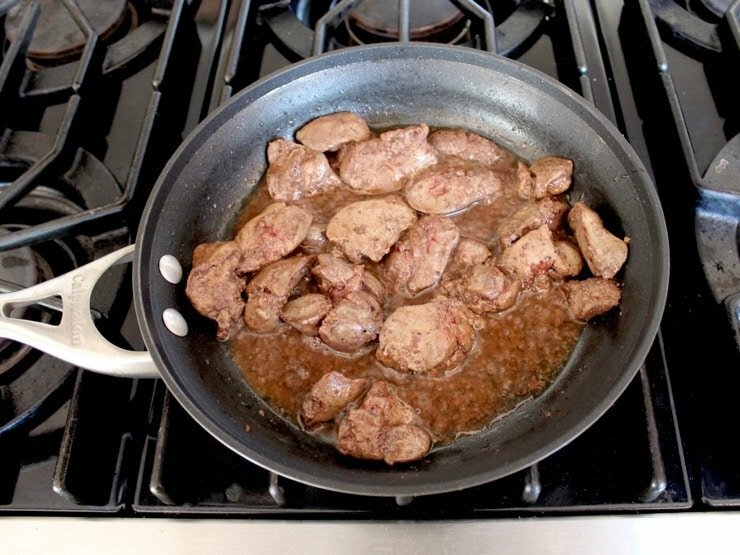 (1) I use olive oil and half a tsp of duck fat (I kept some after roasting a delicious duck) to very gently (on low) simmer/fry 1 lb of kosher chicken livers, (I don’t bother removing any connective tissues) plus the chopped onions, plus grated ginger. (2) Once they are done, I let cool, finely chop the parsley, mash a small boiled skinned potato, mash two avocados, mix a tbsp of ground flax seed. 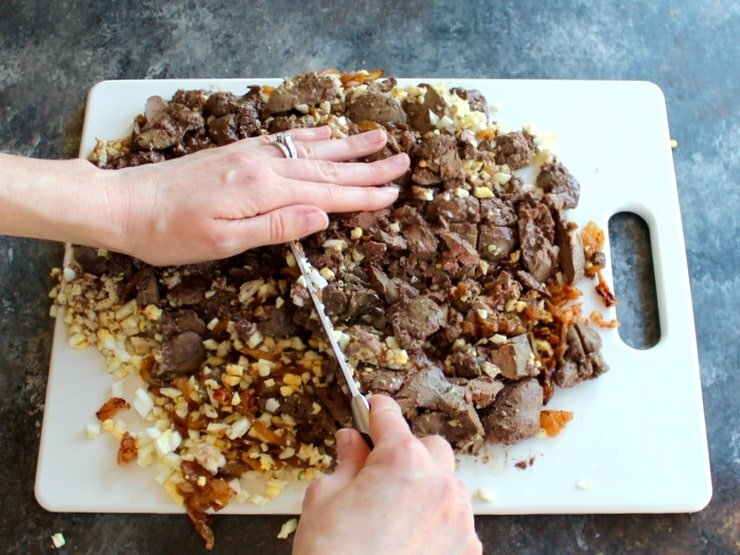 Pulse a few times in the food processor the cooked liver, onions, and ginger plus two hard boiled eggs, and at the end mix in (2) to the chopped liver, which should not be too finely ground to a creamy paste, but should have consistency. Everyone raves about this, and no one has ever realized that they are also eating avocado and flax seed. I tired to replicate my grandma’s chopped liver for this Pesach, and your recipe was a great start point. There were a few places I had to make changes to get the taste right. First, you caution against blackening the gribenes. I found some blackening essential to get the flavor right. It’s like charring a steak on a charcoal grill — done right there isn’t a burnt flavor, but the fatty flavors get highlighted. 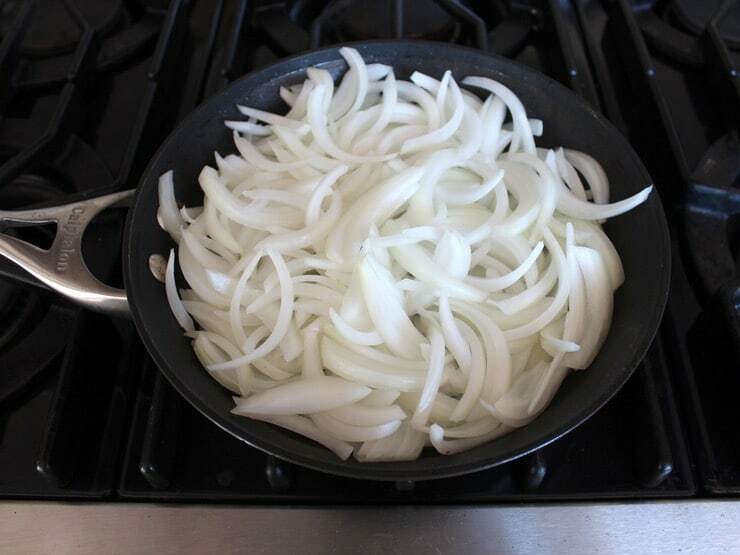 Also, after the whole megillah was done and chilled, I found i needed to saute another onion in schmaltz to boost the umami tastes. And rather than rendering my own schmaltz, I used store-bought organic duck fat. Probably closer to the traditional goose fat in any case, and delicious. BTW, your suggestion of briefly pulsing the food processor gives a texture very close to a hand grinder. You should probably caution your readers not to overdo the blender, or they’ll wind up with a paste. I used venison liver this time. (it is good and a little on the sweet side) But at least I learned what Schmaltz and Gribenes are! WOW!! Incredible recipe Tori!! it’s Beautiful!! So. . .yesterday my 80 year old mother stated she had a craving for chopped liver and matzo ball soup “like mama used to make” Keep in mind my grandmother passed on almost 60 years ago and my mother never learned to cook certain Eastern European foods – My aunt, who would make these treats for her passed 8 years ago, so found your recipe and tried it – hoping for the best, but prepared for a disaster. This was so easy to make!!! And she loved it!!! It yielded more than we can eat in a couple of days so most of it went into the freezer!!! 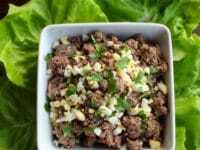 This recipe covers the most essential components in chopped liver preparation, including the use of schmaltz and gribenes. The proportions are just right, as well. The note on koshering is spot on. With so many variations and modern-day twists out there, thank you for making this age-old classic available to all in the digital age. Chopped onions added to sautéing chicken fat is essential ! Otherwise, there is an off flavor that is distasteful. I love Tori’s recipe but I find to really make it smooth out finishes especially for those new to chopped liver, I add 1-1.5 tablespoons of Cream Sherry and it rounds out the flavors. I have tried a number of others recipes but keep coming back to Tori’s. So I signed on to make the chopped liver this year as a guest at a big seder…little did I know that the big seder swelled to 45! Ah well…I’m in it to win it now. My Grandmother’s CL was famous throughout the Jewish community in Cleveland, but her recipe is lost to the ages. I’m fairly certain that this one will do it justice, so I will be sure to let you know. Question: I remember her using a table-top hand-crank meat grinder as opposed to a chopping bowl or food processor. Any thoughts on that? I have both so I could go in either direction. Thanks in advance for the input and thanks for the recipe. Both methods work. One takes more elbow grease. 🙂 Some people swear by the texture of the grinder. Frankly I don’t notice a huge difference either way. Good luck, that’s a very big Seder! I love this recipe and so do my guests. Can this be frozen? The only one demonizing anything is you. Try a little less arrogance and generalization – neither are very healthy. Additionally, schmaltz is a traditional ingredient in chopped liver, which Ashkenazi Jews have been preparing and eating long before Americas founding fathers were even born. cath i totally agree with you about us americans ! now i again eat tons of butter ,eggs , bacon, cheese , raw whole milk , raw cheese, whole milk greek yogurt ,[ all organic and mostly from local farmers ] liver whenever want to, we grew up eating butter and delicious meat dishes then we in america were told butter is bad and we must eat margarine , that was sure a mistake ! can’t wait to try this recipe thank you ! and i have chicken fat in the freezer havent used that before ! never mind the “not-traditional” critique, it’s the ingredients that count, not the method of mixing them. this recipe is just like my Bubbie’s, using a decent amount of schmaltz — no mayo or oil or butter — hard-boiled eggs (not too many), and GRIBENES! the most heavenly morsels — they literally melt on your tongue. 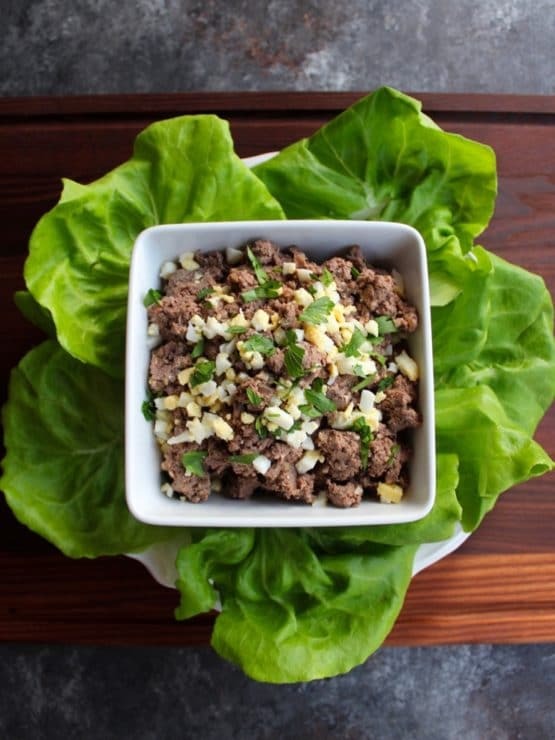 what a great addition they make to an honest-to-goodness chopped liver dish. Excellent recipe. I like getting a split French roll, layering pastrami, chopped liver, and red onion with a little mustard. Makes a great sandwich! Thank you Tori! 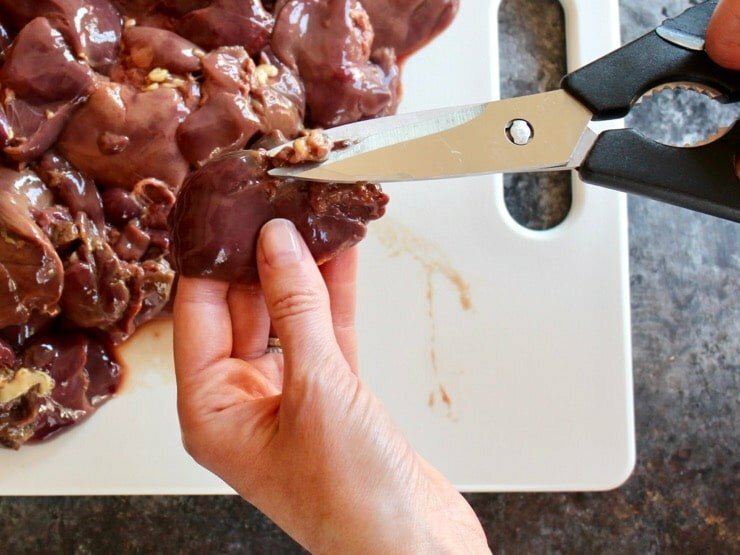 If you can only get FROZEN livers (pray the butcher is honest), to avoid a “sour” taste which sometimes occurs, soak livers in milk for an hour (not kosher, but controls the taste). Katz’s in NY bakes calf liver to medium and mixes it with chicken. Delish.. The sour taste can also come if the bile duct is not removed, (when you don’t buy kosher livers). It is a kind of yellow, take that out. My father-in-law told me his grandfather used to make it by cooking the liver separately on a paper bag directly over an open flame, as the bag burned up he would grab the liver last minute before it fell into the flame. In this way the blood would not mix with the other ingredients. Anyone else hear of this method? Just heard from a highly recognized cardiologist that schmaltz is better than oils. Less cholesterol than in oils and margarine. Have a lovely schmaltz whatever. Dietary cholesterol is not converted to cholesterol in the body. Ingesting it has no effect on you cholesterol level. The production of cholesterol in the body is from consuming refined sugars, and grains such as wheat, rice, quinoa, barley, etc. Studies have shown humans have lower cholesterol when they limit consumption of these products. One such study in Israel showed that the Atkins Diet was best at reducing cholesterol, the next best was the Mediterranean Diet, and the Low Fat diet actually increased cholesterol despite being lower in calorie count. The book: The Big Fat Surprise by Nina Teicholz explains in detail the human body’s needs in nutrition especially natural fat intake. Quinoa is NOT a grain, it is a gluten-free seed. Also, Teicholtz’s book has been criticized by nutritionists and doctors. Chopped liver.I first tasted it when a polish lady tought me how to make it more than forty years ago in London. If you wish to make it the traditional way, never use the food processor but a fork! and schmaltz of course. There is no reason to make very large portions,eat sparingly and it is good for you. Needless to say, the great jewish delicacy Gefilte fish is not a Mousse, it must be coarsely chopped and juicy, and let it stand a day or two in the fridge before serving. Bon appetite! Naomi. I made this once before and it was delish! I made again today and may not have cooked the livers all the way through. I cooked them at least 4-5 min per side, and I know you said not to overcook. But they were still a bit red inside. I thought they would cook more after, but after blending, I put in fridge, and there is s little blood that I can see. I ate some yesterday and feel fine. But do you think I should throw it all out? I do plan to freeze it in portions, so that might kill anything, right? Thank you!!!! Hi TB, there shouldn’t be any blood. I always err on the side of caution in cases like these, though I hate to waste food if it were me I would toss it out and start fresh. Just not worth risking foodborne illness. Freezing does not kill certain types of bacteria, in fact they can continue to multiply even in the freezer environment, albeit more slowly. Sorry! One of my favorites was her chopped liver. Unfortunately I lost her recipe, and my mother-in-law doesn’t really cook. So I am thrilled to find this recipe. I will let you know if this ‘shiksa’ is able to make this dish like Nana’s! I love chopped liver made properly… I would suggest that one uses goose liver rather than chicken. Most butchers shops will have or obtain them for you upon request. 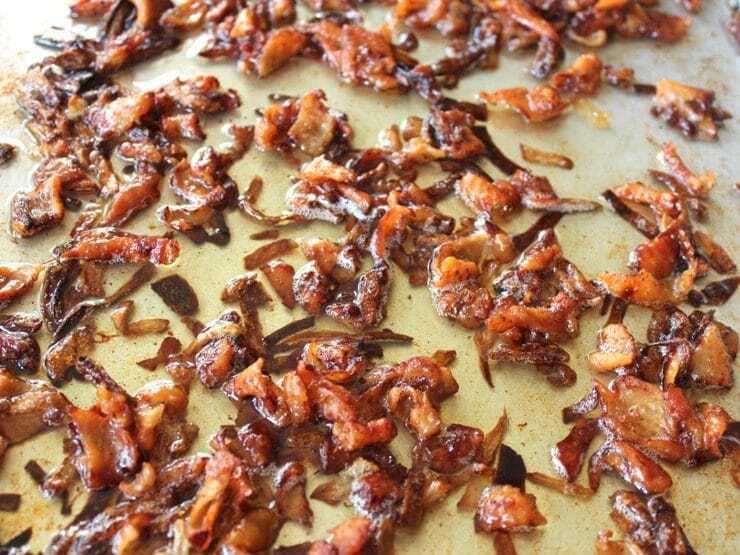 I love the Schmaltz version but have done a preferred version that uses BEEF bacon renderings instead. Never seems to be enough for the holiday crowd, first item on the table that is gone and all ask… is there more? I must limit my sodium intake. Would it be possible for you to provide the nutritional information? Just wanted you to know, this was a huge hit on the Pre Thanksgiving buffet! My sister from out of town,who is as fond of great chopped liver as I am was so thrilled to see it on the buffet, and I even sent some home with her in little silicone cup cake cups to freeze for a quick snack or sandwich at a later time (it freezes very well in silicone cups). Even some folks who have never had good chopped liver, let alone anything with the word liver in it enjoyed it. Thanks again! So happy to hear that Jan! This really is the most amazing chopped liver ever! As a woman of German and Jewish decent, I love cooking and feeding folks, and having worked in wonderful Jewish Deli’s while going to college, I have missed having any Jewish deli’s within 50 miles, and have been on a search for years for a great recipe until I came across this! The texture and flavors are amazing, and so easy! Thank you so much, I look forward to trying many of your other recipes which sound/look fabulous! This however is one that will be made very often in this household! I’ve made it 4 times so far, and doubled the batch for a Pre Thanksgiving buffet tonight. Schmaltz and Gribenes were what were missing in all other recipes I tried. I could not find any butchers or grocers who would sell me chicken fat/skin, so I’ve been saving up, so we’ve eaten many chicken meals since I first found your recipe since I wanted it exact, and am so glad i did, what a difference it made in the final product. My family laughs at the big ziplock bag of Chicken skin and fat in the freezer, thinking I’m the only woman who saves chicken fat! Thanks a million! I’m going to attempt to make this and bring it up (hopefully no one will be sick so I can go) for my best friend’s dad to see if I can make something close to what his grandma used to make. My only problem is I don’t have a food processor. Will just chopping this on a chopping board (in batches) with a pseudo chef’s knife work? 🙂 I’m assuming I’m going to be doing a lot of chopping since it needs to be rather fine in texture. Absolutely Cherry– in fact, some folks prefer the texture of hand chopped! my Bubbie Golda had a single-blade chopping utensil that resembled a mezzaluna, and a wooden bowl, for just that purpose. but i’ll take the FP with no feeling of guilt. it won’t change the ingredients, and as long as tthe chopped liver has schmaltz and gribenes, it can’t go wrong. This is a great recipe…Can’t wait to make this!! My maternal grandmother, Anna, grew up living on her Uncles’ estate in France and they were one of the few Jewish families in that part of Provence for many years. She learned the best of REAL French cooking as well as the most amazing Kosher recipes imaginable. I went to our local Kosher butcher and got enough chicken livers (about 4- 5 lbs) to make a batch, and tried using your recipe. Much to my delight, it was/is as near to my grandmothers as I have ever been able to get! I did use my Grandmothers ancient cast iron skillet (the big one is 13 inches across, weighs a ton, and tends to scare off female users for some reason) and the real schmaltz and gribenes that I actually made myself – thanks to your kind reference and recipes for them both. (As a precaution however, I will admit that I did order a jar of rendered frozen schmaltz from my butcher, just in case I screwed up the rendering process or burnt the heck out of it in my haste.) Fortunately neither happened and I got the fresh schmaltz and the gribenes made before I started the Chopped Liver recipe. The butcher did send the extra kosher chicken skin and fat trimmings at my request and charged me like $2.00 per pound for doing so. I can hardly complain at that price. Thank you SO MUCH for this recipe! It is indeed a classic. And to those tempted to use oils or other substitutes for the schmaltz and gribenes – do not do so! 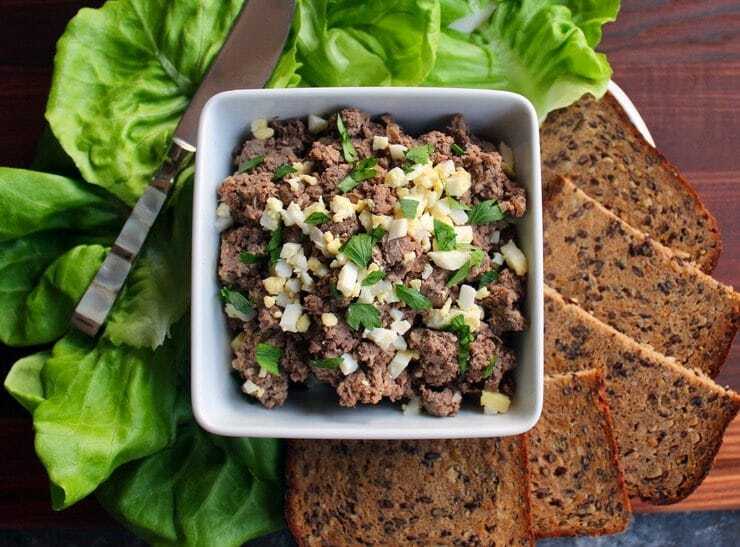 You will still have a decent batch of Chopped Liver of course, but not anywhere near the real flavor you can achieve using the “real” ingredients. If you are worried about the fat and cholesterol – just eat a little less of it. The real thing is too good to be avoided – even if it means a smaller portion. BTW: of course in grandma’s day, a food processor at home was unheard of. I can remember her putting the cooked ingredients thru a hand-cranked food mill and I got to help by cranking it while she spooned the ingredients into it. The food processor does as good, if not a better job, with the only warning being to NOT over-process the Chopped Liver. It is supposed to be a bit grainy and have a course texture. Remember, IT is supposed to be CHOPPED LIVER, not pate’ In the days before food mills and food processors, the old fashioned way of chopping it was to do so by hand using a large knife on a large marble cutting board. When I was young, I can remember grandma’s hands literally flying as she would chop and dice not only this but most other things by hand, as well. An added caveat: Use the sharp blade in the Cuisinart and use only the “pulse” button. Open the lid to check frequently for texture as you scrape the sides of the bowl down to insure it all gets chopped. Remember you can always chop it finer if required. 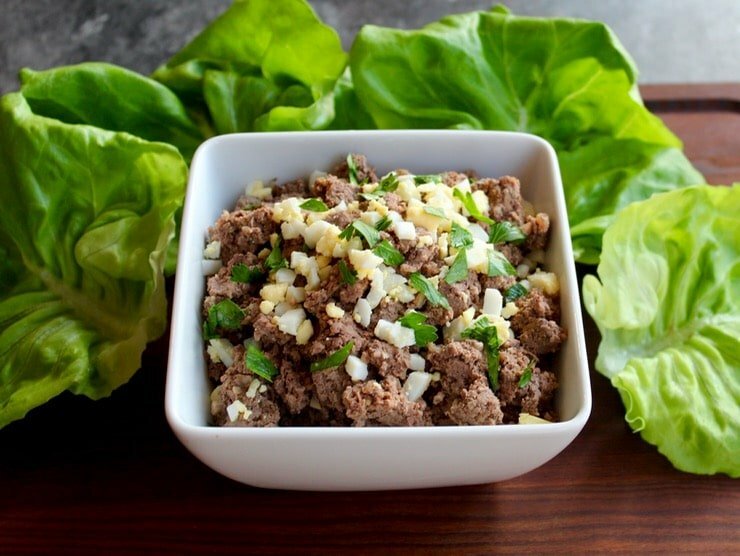 But once it is too fine, there is no going back… while you could still serve it (no loss of flavor of course) to family — you might hesitate to serve over-processed Chopped Liver to guests who know what it is supposed to look like! If you have the newer largest Cussinart Food Processor, it will handle a 14 cup portion at one time. You can easily do a 4-5lb batch in one bowel. If you have the smaller models, break the recipe up into two or three batches so it will process/chop evenly and correctly. Take your time. This one is a KEEPER, I promise you! This is so good, even without schmaltz, just evoo, I could eat it with a spoon……. my grandmother died several years ago and i now live in florida with my son. i have tried to recreate her recipe but it was always missing something. my grandmother wrote nothing down so i was always going by what she showed me. thank you so much i made this recipe the other day and it was the gribenes that were missing from my memory. it brought me back and allowed me to share with my son real chopped liver. thank you thank you!!!!!!! Nanci that warms my heart! Thank you so much for sharing! If kosher-ness is not a concern. Bacon fat in place of schmaltz is a very nice substitution. Liver and bacon is a classic flavor combination. I’m going to make it with beef liver. Do you have a recipe for that? 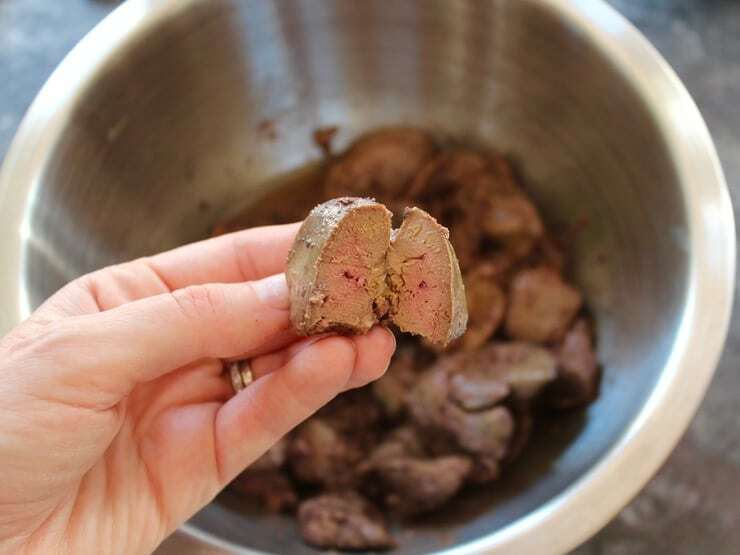 Hi Sarah– not on the site, however I think this would work with an equivalent weight of beef liver– just chop into smaller pieces before frying. I agree… you must use schmaltz. But the best way to add the hard-boiled eggs is to push them through a fine mesh sieve,just like my beloved grandmother taught me. It’s a lot of work, but worth the effort. Just make sure that the eggs are at room temperature and it will be easier. Yum! Funny… my dad taught us to use a cheese grater on hard-boiled eggs. I’ll have to try the fine mesh method. Grandma knows best. About time to make more anyway. Just finished making my chopped liver [schmaltz & gribenes too] per your recipe [my kitchen looks like I cooked 5 courses for 200 people… LOL]. Turned out very well, although, tomorrow, after it rests I’m sure it will taste … deeper, wider, more complex. Tori, thank you so much for the recipe, it’s going in with all my recipes [grandma’s, mom’s, dad’s… a best of the best collection, if you will]. Out of respect of those that weren’t able to make it here to the US, for one reason or another, make this tasty treat the way our great grandparents made it. Full-fat and full-flavor. There’s a reason they lived well into their 90s. Moderation was only one facet of that. Years ago when I was working as a nurse on Long Island, I had this wonderful Jewish lady as one of my patients. Each year after Passover, she would always bring me some chopped chicken livers for me to enjoy. Now I can make my own! Thanks! I am a shiksa married to a Jewish man for 55 years. Your recipes are wonderful and much appreciated by my husband ! A Jew went to Asia and made this for his friends. They suggested adding ginger and hot pepper. The Jew refused, thinking that this Asian twist would be an abomination of tradition. Then the Jew finally gave in. . . . place a large spoonful of schmaltz in the pan with fresh, shredded hot pepper and ginger. Press / mash the peppers and ginger into the oil while heating, then infuse this into your finished chopped liver. 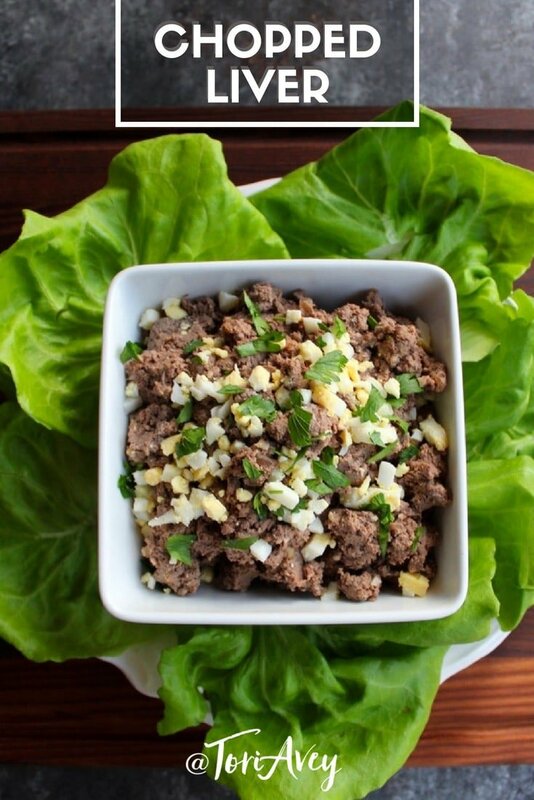 It’s an outta-this-world-amazing Asian twist to our traditional chopped liver. Great recipe!! I’ve been trying to work liver into my diet more, and this recipe not only gets healthy liver into me, but it also reminds me of my childhood!! Thank you so much! Loved your recipe. Hard time finding shmaltz. Had to render it myself. Schmatz really makes a big difference! Alas no schmaltz on hand however just happen to have some rendered duck fat that will HAVE to step in for me today. I’ve been dying for my grandmothers chopped liver. Btw your body makes most of your cholesterol. What you consume comes in second. Blame or thank your genes! Yummy fat in moderation. No, Victoria Meyer, canola is not a GM product but is the result of good, old fashioned plant breeding in Manitoba, Canada. What is this prejudice against canola? It is one of the most healthful and environmentally friendly of all the oil crops. If you use an electric hob, you have to set it on high, not medium. I used olive oil and waited for ages on medium , but absolutely nothing happened until I turned the heat up to high. Also I only used 2 eggs and no gribenes. 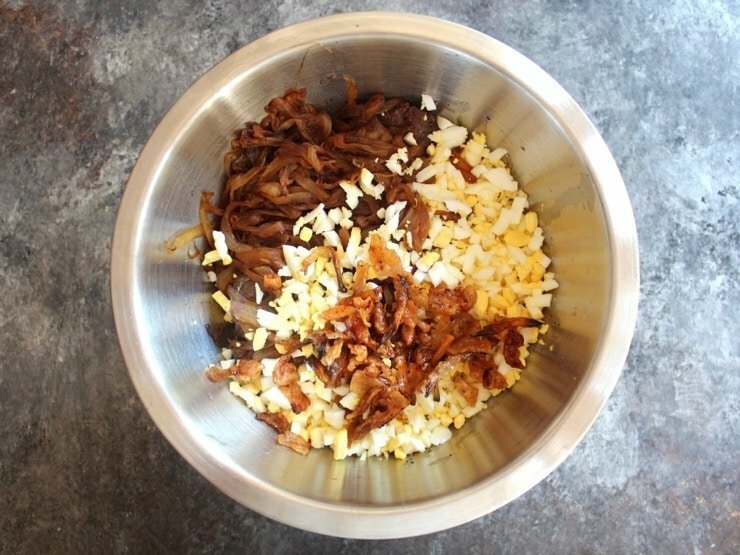 I chopped the liver and onions with a curved knife in a shallow bowl and added a few drops of tabasco and some freshly ground black pepper while I was mixing – I never use salt so this gave it just enough seasoning. I chopped the eggs separately and just stirred them into the mix before pressing everything into a terrine mould to rest in the fridge overnight. The finished product was very excellent. Thank you very much for your recipe – even though I changed it a little. In reply to Annmarie regarding oils and autoimmune disease. I have avoided cooking with animal fats all my life except on the odd occasion. I suffer from psoratic arthritis which is an autoimmune disease so it makes me wonder after reading her blog, you think you are doing the right thing but who knows. I will be making chopped liver with a vegetable fat which is made with the flavour of rendered chicken fat, exactly the same flavour. Do you have it in the U.S.? In uk you can get it in most kosher supermarkets. So glad that someone commented on the politics of nutrition!! We were misled to believe that saturated fat and organ meats are bad for us, when in actuality, they are the very foods that our bodies thrive on! There is more and more research showing now that vegetable oils (corn, soy) and canola oils are actually extremely dangerous oils to be cooking with- they lead to inflammation in the body and can cause auto immune diseases, heart disease and allergies…… definitely stick with the schmaltz! your body will thank you! I have been looking for low-carb/high-fat recipes, and this one looks really tasty. Read Gary Taubes’ Why We Get Fat, and you will understand the science and politics of nutrition. Then you can enjoy chopped liver with schmaltz guilt-free. I’ve been reading some of the recipes here and was particularly interested in the “chopped liver”. Especially the term “gribenes” and its description. It reminded me that we have a similar thing in Switzerland where I come from (although I now live in New Zealand). My grand-mother used to make “taillé au greubons” which is a confection of scone-like dough with little crispy bits of fat-rendering left-overs. Those greubons were bought from the butcher when hard economic times dictated that nothing should be wasted. Unfortunately, here ends the similarity of gribenes and greubons as the latter is from the rendered fat of pigs. But since cooking is all about adapting, I can just imagine how tasty and delicious this “taillé” would be if greubons were replaced with gribenes! To finish, a quote from a NZ Tv cook: recipes are like kisses, they are nothing until you share them. As a widower I have reentered the social scene. I place a high value on ladies who do chopped liver like my bubbe used to make. Your recipe is right on! Zeit gezundt! this chopped chicken liver recipe is banging, seriously, the best I’ve had, maybe that’s because I made it, but I just followed this recipe (and the one for schmaltz and gribenes) and I am golden, I wanna share this chopped liver with everyone. I made brioche to put this on, not kosher, I know, but so good. Thanks Shiksa. Oh yeah, Tori…this is the real thing…thanks for sharing…my grandmothers are both “kvelling” from above!!! This recipe is very similar to the recipe my in husband’s family. Bubbe used to make chopped liver for every possible occasion, and while my husband was not raised Jewish, much of his maternal side is. Prior to marrying, I had little to no exposure to Jewish cooking and yet I now prepare the chopped liver for the holidays! I was told Bubbe never wrote down any recipes/measurements, so with the help of my husband’s aunt (since Bubbe is no longer with us), I finally arrived at the “right” mix. We use a combination of both beef and chicken livers (broiled) with schmaltz, onion & hard-boiled eggs. I grind the ingredients in my KitchenAid with the grinder attachment to get the perfect consistency that Bubbe achieved using a handheld grinder. I love your website and love reading about your culinary adventures! Chicken livers need to be broiled to kosher them. After cleaning the livers (excess fat, etc…), I then put them into a colander and sprinkle with salt and let them drain for about 1/2 hour. I then put them under the broiler for a few minutes on each side, until slightly pink in the middle. My mom always insisted on chopping by hand her chopped liver. 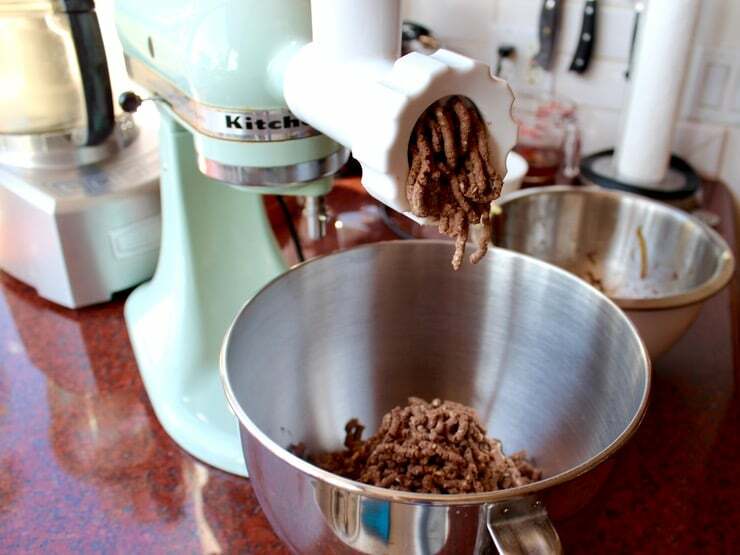 (After all, it is called chopped liver, not food processor liver.) It makes for an entirely different texture and I think changes the taste. Of course, she was still making gefilte fish when she was in her 80s and insisted that it also be chopped by hand. By then I was the chopper and it took literally hours of chopping. But liver is much less chopping time. Give it a try…. My mom[may she rest in peace] did this same way and it was the best gefilte fish and chopped liver,i still remember the taste.Thank you for the memories! i agree. texture is everything. 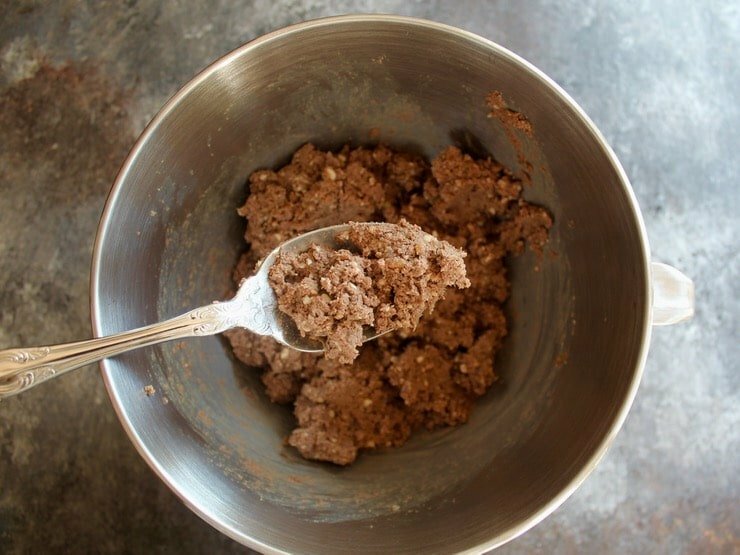 blended liver has a texture like the filling that goes into commercial wieners. hand chopped is much different and, in my opinion, transfers the love that goes into the process. I wouldn’t go to the trouble of making this without the schmaltz and gribenes. I’m not Jewish but I believe in authenticity. I don’t believe it would taste nearly as good with substitutes, and I only make it for a holiday. It’s always for a group, and no one eats very much of it. I don’t seldom eat ice cream for the same reason, but I feel it’s part of living. You’re too funny! “Have your cardiologist on speed dial” – LOL! I live in South Carolina, I want to know where I can find Schmaltz and gribenes or what would be a good substitute. Being here is living without alot of everyday ingredients. I hope to ask enough times that the stores will start having a more diverse supply of foods. I love to cook and enjoy cooking many different ways. Thank you for being on Facebook where I found you. What a wonderful time I have had reading. Bee Jay, you make schmaltz and gribenes by tearing the skin off a raw chicken and pulling off the fat. Then cook the fat and skin in a skillet with salt and pepper until the fat renders off the chicken (schmaltz) and the skin gets golden brown (gribenes). Take the gribenes out of the pan and let them blot on paper towels. Voilà! You have Jewish chicharrones. Sorry this is a couple of years late. Buy a roasted chicken from the supermarket. There will be a bunch of great chicken fat at the bottom of the container. You can peel off some of the chicken skin and fry it up and make delish gribnes. Chicken fat is extremely unhealthy, besides, real Schmaltz and gribenes is really made from goose fat which surprisingly (to those who follow uninformed doctors), is actually quite healthy and makes the so called “French Paradox” redundant. how appropriate that i was just pointed towards your site, and i find you posted about chopped liver on my birthday! its “beshert”! You’re making me hungry! Liver is an acquired taste. I personally love it, always loved it since I was a kid. Our aunt used to make it on Passover. Spread some on matzo, what memories. I add Mayo to my chopped liver and it gives it a creamy texture. Anytime I’m asked to bring something it’s always my chopped liver. I made 8 lbs. for my friends sons Bar Mitzvah and there was none left. Elaine- I also add the waspy-addition of mayo. Not to the chopped liver but slathered on bread under the CL. Yummy! It’s like you read my mind! My BF has been asking me to make chopped liver for him. I can’t say liver is really my thing, but I’ve tried a few of your recipes and my BF loves them, so I’ll give this a shot! Wish me luck. Yum! Thank you for posting the RIGHT way to make chop liver. My wife tried it a few times with vegetable oil but it’s not nearly as good without the schmaltz. Bubbe knows best! Our family serves it as a treat a few times a year, why compromise? Schmaltz and gribenes are unbelievably unhealthy. 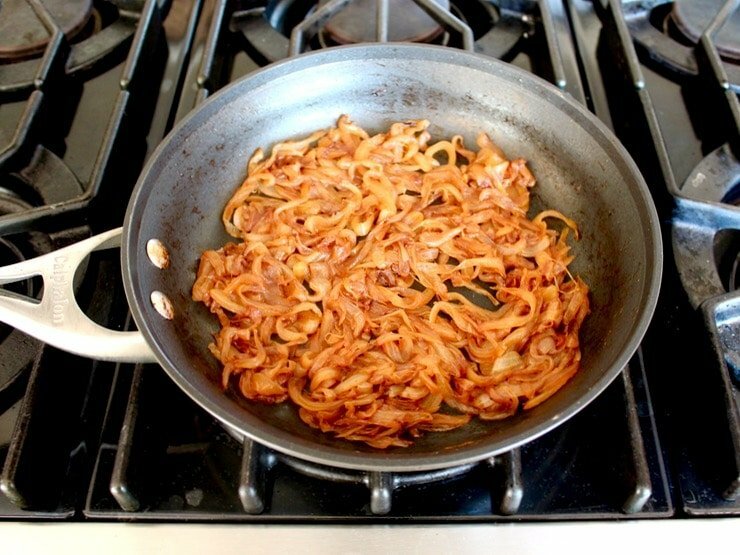 Most Jewish cooks stopped using them years ago — including my grandmother! Making the chopped liver with canola oil and lots of fried onion yields a DELICIOUS and healthy result! Everything is good in moderation.Their is no away you can change the old taste of jewish food with all this americanized new recipes.I love my mom[let her rest in peace] and her old world recipes and i will not change them.Schmaltz is good for you,its better than than other foods that the most of american jews eat it restaurants like pork. Canola oil is actually less healthy than Schmaltz, especially if the Canola is GM and the only way to guarantee that is if it is organic. Canola oil hydrogenates much more readily (which is carcinogenic) than Schmalz, which is more suitable to frying. I think you should trust traditional wisdom rather than corporate marketing. Plus it tastes better!! Victoria is correct. Saturated fat is much healthier than canola oil. I agree with Victoria and Eric. Neither the liver, nor the eggs, nor the schmaltz is unhealthful. It’s the carbohydrates in the bread/crackers on which you spread the chopped liver that is the unhealthful bit. I think I’ll use celery. The whole saturated-fat-causes-heart-disease hypothesis has been largely discredited. According to the World Health Organization in 2010, Intake of SFA [saturated fatty acids] was not significantly associated with CHD (coronary heart disease) mortality… SFA intake was not significantly associated with CHD events (e.g., heart attacks). In the same year, The American Journal of Clinical Nutrition published a meta-analysis of 21 studies that looked at the effects of saturated fat consumption on coronary artery disease. The conclusion? A meta-analysis of prospective epidemiologic studies showed that there is no significant evidence for concluding that dietary saturated fat is associated with an increased risk of CHD or CVD (coronary vascular disease). So enjoy your chopped liver the way grandma made it. It’s full of healthy fat, vitamins, and nutrients. Just avoid having it with bread. Canola oil(rapeseed oil) is absolutely terrible for you. It is processed and refined, and creates inflammation. Schmaltz is the way to go. i would not eat the fat (or the meat) of a chicken raised industrially, but i would eat a chicken raised as free ranging, on organic feed. same goes for eggs. there is no point in being choosy over the non GMO canola, and not being choosy with the chicken! Judy, canola oil is genetically modified rapeseed oil. Schmaltz is so much better for you. This recipe is making me hungry! Don’t be afraid of healthy fats. I like Joel’s idea of serving it with celery. So… You vant to live forever? MY MOUTH IS WATERING. Thank you Shiksa!